The Parish of St. Teilo’s was founded in 1925 and has been serving the needs of the Catholic population of the north-west of Cardiff for almost 90 years. In the 1950s part of the parish became the new Parish of Our Lady of Lourdes in Gabalfa to accommodate the growing Catholic community arising from the new housing in the area. Before St. Teilo’s was founded as an independent parish in 1925, the area officially came under St. David’s Cathedral, Cardiff. A building in the grounds of the Fox and Hounds, which was being used as a betting shop in the 1990s, was used for Mass. Parishioner Lottie Rogers, who wrote a booklet about the faith in Whitchurch, recalled that many Catholics from Whitchurch and Llandaff North used to walk to and from the Cathedral for Sunday Mass. At the request of Fr. Ernest Grieshaber, Administrator of the Cathedral, Miss Rogers, then a student, started a catechism class in Whitchurch in the early 1920s. Around 1923 Canon Daniel Hannon, the Cathedral Administrator, was petitioned to open a Mass centre in Whitchurch. He agreed if twelve people could be present at the service. The first Mass was said at the outhouse of the Fox and Hounds on 3rd February 1924. Canon Hannon, who later became Bishop of Menevia, celebrated what was the first Mass in Whitchurch since the Reformation. In the 1920s new housing started springing up in Rhiwbina and Whitchurch and more Catholics came to live in the area. Fr. Tom Phelan was appointed as the first Parish Priest of St. Teilo’s in 1925, not long after Archbishop Mostyn had bought land alongside the Fox and Hounds for the first permanent church which was to serve the Parish for nearly 40 years. Canon Phelan became a lodger at a house called Conyfern, in St. Margaret’s Road, Whitchurch, not far from the site where the former parish hall was built and opened by Archbishop Mostyn on 4th April 1925. Fr. Phelan ploughed a lonely furrow in Whitchurch for nine years before he was given the assistance of Fr. John Magner in 1935. Fr. Phelan left Whitchurch in 1936 on being appointed Parish Priest of St. Patrick’s, Grangetown. Fr. 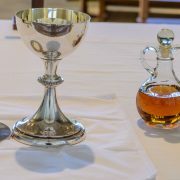 Phelan was succeeded at St. Teilo’s by Fr. Thomas McCormack (1936 to 1941) and then Fr. William Probert (1941 to 1946). During the war years, there were two curates, Fr. Bernard Driscoll and Fr. Patrick Fitzsimmons, at St. Teilo’s, partly to serve the American troops stationed on Whitchurch Common and the wounded servicemen being treated at Whitchurch Hospital. On 10th May 1943, St. Teilo’s had a narrow escape when a parachute mine fell on Glan-y-Nant Road, adjacent to the church, killing a fire-watcher, 74-year-old Richard Hopkins. Fr. William Randall was appointed Parish Priest in 1946 and he was followed in 1951 by Fr. Joseph Johnson, who during the war had been a chaplain with the East Kent Regiment and went to France with the Division after D-Day, 6th June 1944. He celebrated his Silver Jubilee while at St. Teilo’s. Fr. (later Canon) Patrick Creed, was appointed as Parish Priest in 1956 and remained for 43 years, retiring shortly before his death on 25th January 2000. Canon Creed was born in Tipperary in 1910 and was ordained a priest for the Cardiff archdiocese in June 1934. A giant of a man, he did his apprenticeship as a priest in Merthyr Tydfil in the hungry 1930s. Canon Creed was a curate when, in March 1941 he, along with a Fr. Michael Murphy, assisted in escorting the Blessed Sacrament out of St. David’s Cathedral after it had been firebombed. Canon Creed was Parish Priest when the current St. Teilo’s church was built. It opened on the 18th June 1964, the 30th anniversary of his ordination. Canon Creed was succeeded at St. Teilo’s by Fr. (now Canon) Edward O’Connell, a native of Cork City, whose kindness and boundless energy, together with a great sense of humour, were very much on show during the period in 2004-05 when the church building was refurbished and a new parish hall built on the site. He celebrated his Silver Jubilee in June 2005, fittingly just as the refurbishments were being completed. Canon O’Connell retired in January 2014 and returned to his native Cork. He was succeeded by Fr. (now Canon) William Isaac who had grown up in the area. Canon Isaac had been Parish Priest at St. Mary’s in Bridgend for 19 years and oversaw the building of a new church, hall and presbytery in that parish. Many fine curates have served St. Teilo’s, including Fr. Harry Bohan, who was a student at Cardiff University in the 1960s. He returned to Ireland to head the Rural Resources Organisation which built 3,000 homes throughout the country. Desmond Dalton, a curate who served St. Teilo’s in the 1970s, became a Monsignor in South America after serving at a mission station there for more than 25 Years. Another former curate, Cardiff born Fr. Allan Davies-Hale, Parish Priest of St. Dyfrig’s in Treforest, succeeded Canon Edward O’Connell as Dean of Cardiff East. Fr. John Cole served his apprenticeship as a Deacon at St. Teilo’s before he was ordained at Dowlais on St. David’s Day 2003. He was the 12th old boy of Bishop Hedley High School, Merthyr, to be ordained a priest. With thanks to John O’Sullivan, journalist, author and long time parishioner of St. Teilo’s for most of the St. Teilo’s parish history. John died in 2007. May he rest in peace. Click here for the Our Lady of Lourdes page of our parish history. If you have any photographs or stories of parish events or interesting times that you would like to share with fellow parishioners and the world we would love to know! Please contact us.